Chuck, I appreciate your articles – they have helped me a lot. My questions relates to the article on pricing quilting. I'm guessing the same ‘formula' would apply to doing hand quilting for a customer? I am attempting to start doing so and separately may do piecing and quilting if someone wants the entire process done for them vs. having “an old top” they need quilted. Also, any thoughts on including pricing for computer generated design as part of planning a quilt for a customer (EQ5 or QuiltPro) followed by constrution and quilting of course. This formula is a bit controversial – I've had some quilters email me saying it is a bit unrealistic to think you can get this kind of money (and yes, most quilts will take much more than the 20 hours I mention in the article). So, they say that to get more than a few hundred dollars for a hand quilted quilt is unrealistic because of all the cheap, manufactured quilts available. Well, I say this sentiment is short sighted. You should charge what makes sense for your business, and give your customers a reason to pay. You can do this by differentiating your quilts and your skills from everyone out there. Don't just explain that you're going to make a quilt. Tell them everything that goes into making your quilts, and how they will be purchasing a piece of art, instead of just a blanket. worth what we really want to charge, so we lowball our pricing. I do a lot of consulting with small businesses in the area of marketing, and it is one of the most common mistakes that small businesses make. And when this happens, they leave money on the table, or worse – won't be in business very long. much time and effort you are putting into your quilting efforts, and to show you that unless you want to work for less than minimum wage, you need to start charging more. And, if your customers don't want to pay, you need to find better customers. work. You just need to let them know that you offer that type of work, and why you are exceptional. 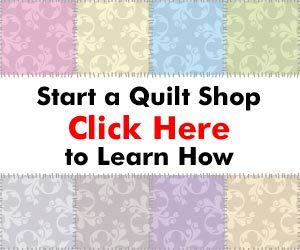 There are a ton of resources out there that will show you how to market more effectively, and hopefully, there will be a lot more information on the QuiltingBusiness.com web site on marketing soon. As far as design work, you should decide what that is worth to you, and how long it takes, and then you can price accordingly. This can be just one more item to put on your price list, and some customers will be very happy to have that option. I know I would. Very interesting comment on E-Bay. Several years ago, I had a selling account with E-Bay. In the first place, placing articles to be viewed was expensive and secondly your category is usually included with dozens of others. My site was Miscellanious crafts. Yes, I sold some, you might say broke even. The bother was not worth the income. I did get an excellent price for a used sewing machine, but other than that, after calculating profit/loss, I cancelled my site. I do buy, occasionally from E-Bay, especially if I need 5 inch squares. I find I do better by word of mouth. Since 2007, I have made and sold 4 quilts 3 queen size and 1 king size. Their combined value near $2500. My work is far from perfect, but my artistry is what sells my products. I’m 81 years old and am happy to be able to construct the quilts. If I sell one, OK, if not, that’s OK too. I’ve watched the quilt business for a number of years and I have yet to find anyone who individually makes quilts on a part time bases, got rich. Hi Virginia – thanks for the comment. I agree that selling on eBay can be more trouble (and expense) than it’s worth, especially for handcrafted items like quilts. There are sites like http://www.etsy.com that specialize in helping artisans and crafters sell their goods to people who will appreciate them. There are folks making a living with quilting though. Not as many as I’d like to see, but there are a number of full-time quilters (including some who sell their art quilts for $1,000s), and some longarm quilters who are doing well. Plus, there are 1,000s of part-time quilters like yourself who make a little extra money on the side doing something they love. Keep up the good work, and if you ever want to share any photos of your quilts, let me know. I’d love to see them!